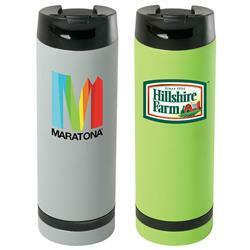 Custom stone finished vacuum sealed tumbler with your logo imprinted and an accent band. Made of FDA compliant materials, our 18-8 Stainless Steel dual wall construction with Copper lined vacuum insulation to provide optimum heat retention. 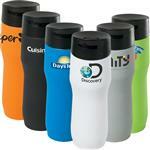 Includes a patent pending flip top lid design with snap locking closure that will prevent your drinks from spilling. The tumbler features a stone finish with a black band on the white and coloured tumblers or a white band on the black tumbler positioned at the base of the tumbler adding a touch of class to our iconic vacuum tumblers. 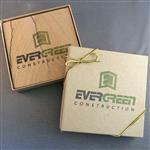 The grey is a great constuction firm promotion as it looks like concrete! • 18-8 Stainless Steel dual wall construction with Copper lined vacuum insulation for optimum heat retention. • Includes a patent pending flip top lid design with snap locking closure. 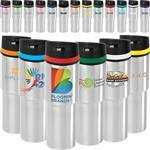 • Black bands are on the White and coloured tumblers or a White band on the Black tumblers.